I’m not going to get to far into the issue at hand with this figure. 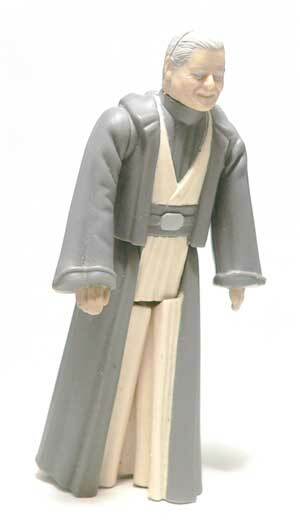 This figure represents Anakin in Return of the Jedi before his digital replacement. No matter which side of that fence you are on, this figure came out at a time before the technology for digital replacement was born. Anakin was a mail in figure for Return of the Jedi. That is how I got mine. 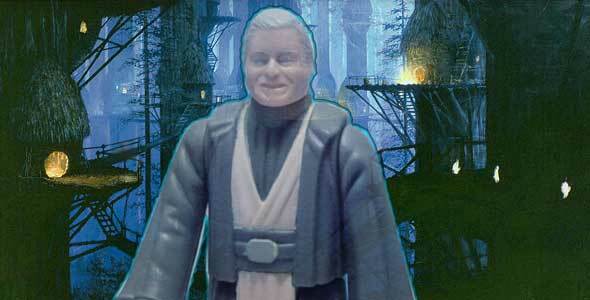 He was also released carded with a coin as part of the original Power of the Force series from Kenner. While an odd choice for that line, he gives us a good idea of what Prequel Jedi figures would’ve looked like if they had been made back in the 80’s. Other than Obi-Wan, Anakin is the only other “classic” Jedi in the Original Trilogy. He has an outfit very similar to Obi-Wan’s outfit. This time instead of a vinyl cape his robes are fully sculpted. I really like the look of this figure. 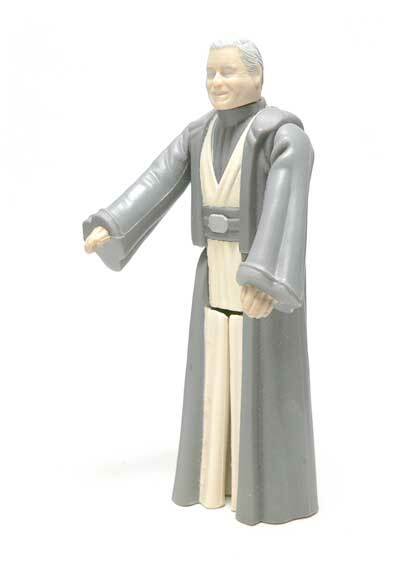 Coming at the end of the vintage line, Anakin benefited from better sculpting. The robes have long folds and are flipped open in the front. The back is completed by a neatly sculpted hood. The sleeves end with a nice cuff detail. The rest of the body is pretty similar to Obi-Wan. Lighter inner robe cinched with a sash and belt. Completing Ani’s ensemble is a turtle neck. The head is pretty nice for the vintage line. The likeness is recognizable as Sebastian Shaw. Not perfect, but not too bad, even compared to modern figures. The overall color scheme of this figure really plays up the “Force Spirit” aspect of the character. 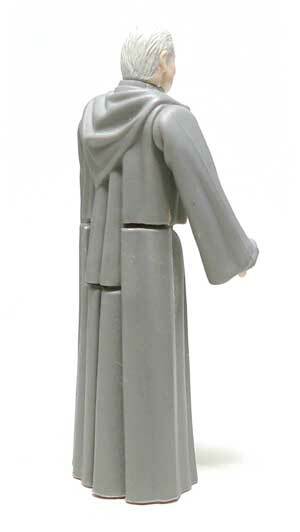 The robe is a grayish color and the head and hands are paler than most other figures. The effect is pretty good for time the figure came out. I might actually prefer it over the translucent version that came out later. This is another of those old man figures that seem to pop up in figure lines. Yes, I understand Darth Ani is an important part of the films. However, in Episode 6, this version is on the screen for a minimal amount of time. He also does nothing but smile at the camera. Considering how many other ROTJ characters didn’t have figures at the time, it’s surprising Kenner would have picked such an inactive character for a boys action figure. Remember at the time, there weren’t nearly as many collectors out there. Along the inactivity line, the hands for this figure are sculpted just barely peeking out of the sleeves. This look does show up through out the Prequel Trilogy and is screen accurate. However, it makes it impossible for him to hold anything, including a lightsaber. The one cool feature of this figure is the inside robes are painted and sculpted inside of the legs. If you bend a leg, it gives the look of inside robes folding out. Pretty neat tech for the time. While not being one of the most memorable figures from the vintage line, Anakin represents an example of what could have been if the line had carried on farther. Better sculpting, a wider range of characters, and neat features for figures to ride the line between appearance and functionality.